These chocolate peanut butter snacks are perfect for a special fall treat or a get together! Everyone talks about this being Pumpkin Spice season, but I bet they never thought about Acorn treats. All you need is Hershey’s Kisses, mini chocolate chips, and the bite size Nutter Butter cookies. 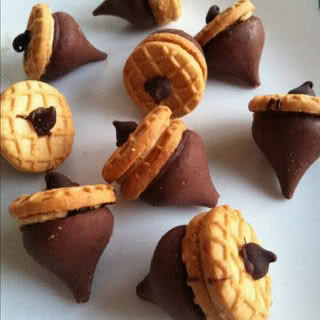 Put aside 1 Kiss, 1 mini chip, and 1 cookie to go as a set and put aside how ever many you want to make. Take the rest of the mini chocolate chips and melt them in the microwave for 5 second intervals, making sure to stir between each. Dip the mini chip into the melted chocolate and hold onto the middle of the Nutter Butter. Do the same with the Hershey’s Kiss on the opposite side. Allow time to cool or put into fridge to accelerate process! Halloween is all about the decor, the costumes, and the candy for your local trick or treaters. Enjoy some tasty, healthy alternatives so when you have some leftover candy you can freely indulge on November 1st! One of my favorite things to do this time of year is taking orange peppers and carving them to look like little jack-o-lanterns. 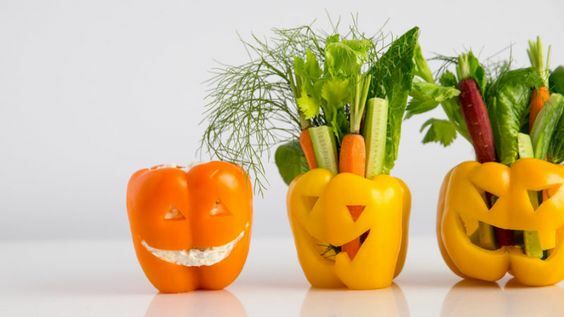 These “pumpkins” can be perfect for stuffed peppers or containers holding some other veggie treats. Up until now we have shared a lot of really simple recipes for the Holiday season, this one looks like it is more complicated but it really is not that bad! A lot of it revolves around referencing the image to correctly place the pieces. 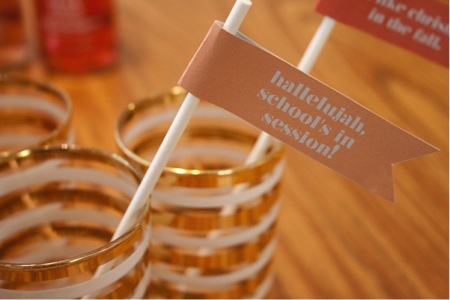 Definitely something to try at your next get together. 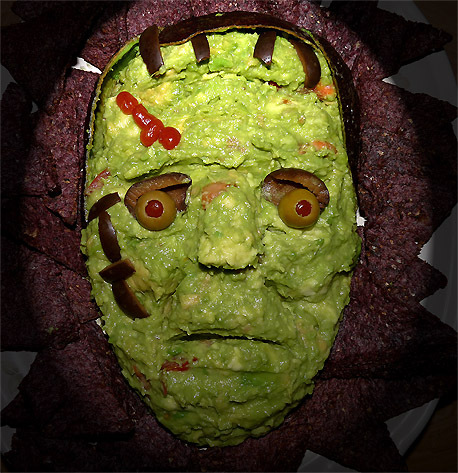 Do you already have a go-to recipe for guacamole? If so then you can pull that out and star to work on that! You could also cheat and get some pre-made and only have to worry about the decorating. You are going to want to Freeze it if you are not planning to use it right away in order to hold the shape. Sliced olives are used to create the stitching anywhere on the face you want them, as well as some hair. Green Olives are used for the eyes. Sun dried tomatoes create the bloody scars. 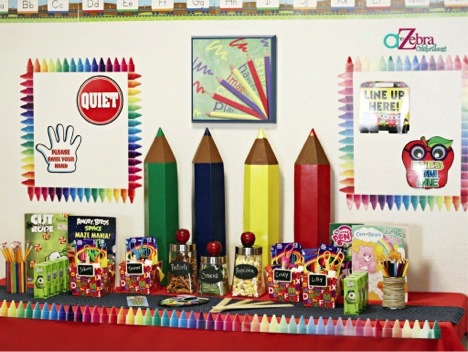 You can be creative in the elements you use as well! Let us know what alterations you made. Garnish with blue corn chips. 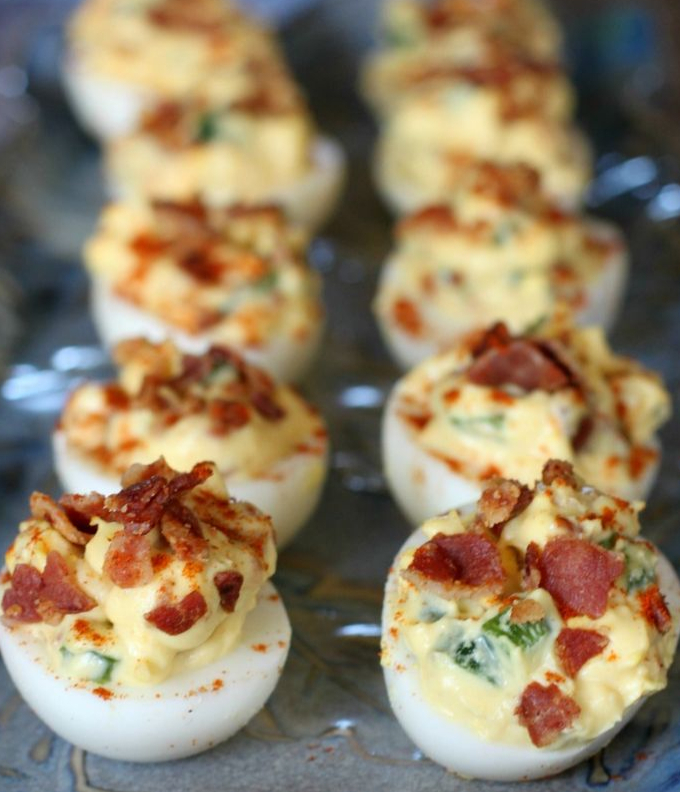 Deviled Eggs have always been tradition at a variety of functions from Easter to Family Reunions. We all have our own family recipes that make them unique and taste “the best” versus anything else your guests have had before! Next time you break out the carton of eggs and boiling water, try some new toppings with your mixture! Bacon and Jalapenos not only add an interesting flair to the eggs, but a unique, delicious taste. With it being football season and many game day tailgates coming up, you can be the talk of the town with your bacon jalapeno masterpieces. Which teams are you watching this weekend? 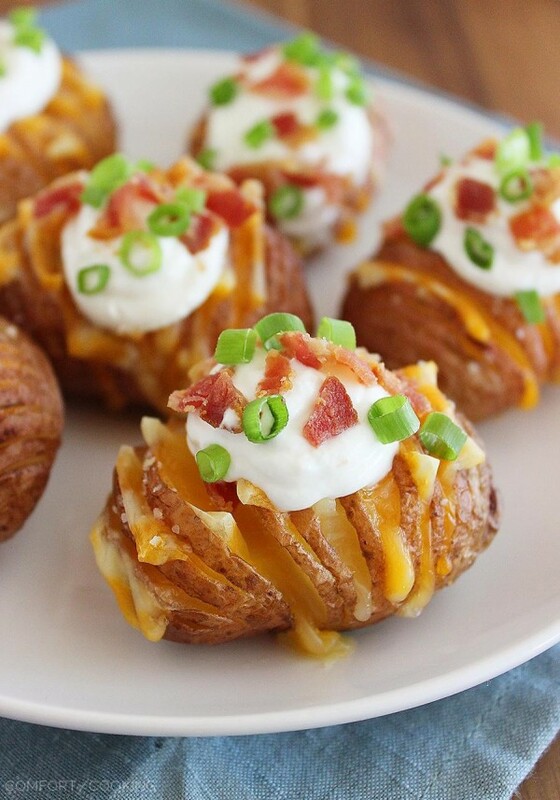 Cook up your own potato bites; perfect for any football weekend! These will become a favorite, I promise! Preheat oven to 400 degrees; line a large cooking sheet with aluminum foil. Make several cuts through each potato with a sharp knife, avoiding going all the way through. Place potatoes on a baking sheet. Rub with olive oil and sprinkle with salt. Bake for 30 minutes, until potatoes are tender. Put cheese slices in between a few cuts and continue to bake until cheese has melted. Let cool for 10 minutes before topping with sour cream, bacon, and green onions, or any other desired toppings.